In the form that follows below fill in your personal details and after checking their correctness press the button "SEND FORM" which is to be found at the end of the page ya will have our reply as soon as possible within the next 24 hours. Alternatively for accommodation available you can call 23750.23531 and 6937.140.208 or send an e-mail. 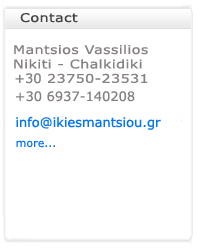 MANTSIOS VASSILIOS - All Rights Reserved.